In previous article I briefly describe multi-layered architecture design pattern. In this post I want to show you some code which implement multi-layered architecture. In this listing we could distinguish infrastructure, application and presentation layers. Infrastructure layer is responsible for data delivery. In this case it creates random radio frame with QPSK symbols. Furthermore infrastructure layer allocates and cleans memory. Application layer is responsible for OFDM modulation and demodulation processes. OFDM modulator it is nothing other than the IFFT algorithm. Similarly OFDM demodulator it is exactly the FFT algorithm. Fast Fourier Transformation and its inverse version are implemented in separate digital signal processing library available on my GIT Hub profile [click]. Presentation layer prints the input, modulated and demodulated frames. Demodulated frame should be exactly the same as the input frame. Full code of this example is available also on my GIT Hub profile [click]. I encourage you to download the code. It will be still developed and I hope that in an interesting way. Multi-layered architecture is a software architecture where different product responsibilities are handled by separate layers. 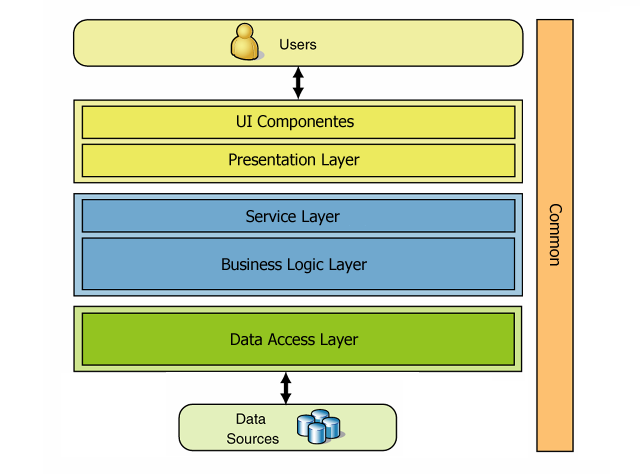 The most common layers used are: user interface and presentation layers, application and business layers, infrastructure layer. Each of them might have its own sub-layers. User interface and presentation layers provide some multi-modal interfaces which allow users to communicate with the designed system using different methods e.g: keyboard and mouse, speech, gestures and others. Please find that this layer might be implemented as a part of a web-service, stand-alone application with or without graphical user interface. Furthermore, multi-layered architecture allows to create presentation layer before others. It might be interesting especially for the people who want to improve a usability, appearance so these parts of the product which often mostly affect customers. Today I want to describe a very simple memory allocator – memory pool with fixed block size. Memory allocators are important especially for embedded systems. Such systems often require a memory management module which help to decrease memory fragmentation and provide efficient memory usage. The idea for a simple memory management module is to allocate memory once and use it frequently. Memory allocation algorithm shouldn’t allocate any memory block outside the pool. It is possible to create more than one memory pool, e.g one memory pool for each queue. Last time I wrote about an interface in C language. Today, I will describe how to implement an interface in C++. Everyone who ever wrote something in C certainly knows that it is a structural language. However not everyone know that object oriented programming in C is possible and quite simple. To start talking about this we need to know what is an interface and how to implement it. An interface is a set of functions and rules which can be used to communicate with some specified object. An interface may be common for many different modules which have similar functionality. In my opinion, the most important purpose of the interface is a separation between control plane and algorithms. It is not hard to imagine that if we define interfaces for our application we can implement each module separately. The interfaces help team to cooperate and divide their work. Developer, who knows how to use all required modules before their implementation, will be more confident and will make less mistakes. Well organized project gives a greater chance to finish it earlier without sacrificing its quality.